Imagine if the Nigerian prince—you know, the one spamming your email—really did have millions of dollars he needed to smuggle out of the country. Imagine he was legitimately offering you a generous portion of the cash to help you out. Think how sad and baffled he would be as yet another email went unanswered, even unopened. His motives are pure—but he lacks credibility, and so he cries himself to sleep on a mountain of landlocked money. You are offering something of value to your audience (aren’t you?). You’re striving to be authentic and transparent and customer-centric and every other buzzword. But like the theoretical Nigerian prince, your content can be ignored if you don’t establish credibility and build trust. To make your content marketing more trustworthy, there are two broad categories to address. First is the surface-level stuff: How your content looks and feels. The second deals with what your content is, the who, what, and how. Let’s take a look at both, starting with the easy fixes. This may be the easiest fix on the list. Set a posting cadence and keep to it. This helps readers make an appointment with your content—it sets an expectation you can continue to meet. If you usually post daily but you go dark for three days, your credibility will suffer. On the flipside, when you consistently deliver content, each post boosts your reputation. A link to a reference post which also fails to source the stat. Your audience needs to get to know your brand in order to build trust. If your messaging sounds or feels different across pieces of content, it’s harder to make a connection. It’s important to have a solid set of brand guidelines to keep your content from developing a split personality. Or, even better, let your brand go transparent and let your employees speak for it—but more on that later. Strike what I said earlier—this is the easiest fix on the list. Make sure you polish your content before setting it loose. Check grammar, spelling, usage, and scannability. You may have as little as 15 seconds to convince a reader your content is worth sticking with. Before they’re hooked, they are essentially looking for an excuse to stop reading, bounce back to the search results, check Facebook, or pursue a dozen other distractions. Sloppy editing work gives them an easy out. Influencer marketing is a big part at what we do at TopRank Marketing and we often write about how influencers help with content amplification. It usually goes without saying that they also boost your credibility with their audience—so let’s say it just this once. Pursue influencers who are recognized and respected as a thought leader in their field—not just the ones with the most Twitter followers. Content co-created with a true influencer can give you a massive credibility boost. Transparency and authenticity are hot buzzwords at the moment, but they’re more than just cliché terms. Let your audience see the people behind your brand, and you’re more likely to build trust. Activate your employees to be brand ambassadors, relating to your audience person to person. If there’s a buzzword more cliché than transparency or authenticity, it’s storytelling. There are so many “storytellers” in the biz right now that the next marketing conference should be around a campfire. In this context, though, storytelling means providing proof with a narrative. Use real-world examples of customers you have helped whenever you can. When you can’t, engage your audience’s imagination with the story of how their lives will change with your solution. 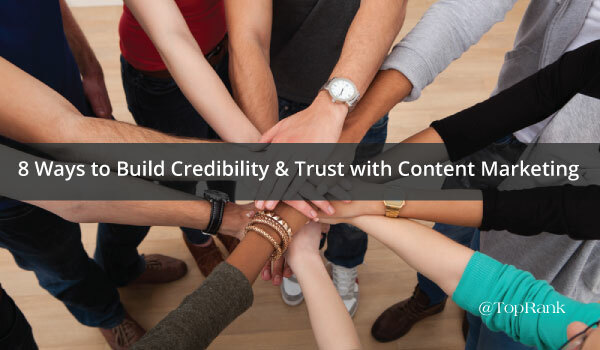 At the heart of it, the best way to build credibility and earn trust is to provide hyper-relevant, in-depth content. Take time to learn your audience, listen to them, and create content that meets needs they didn’t even know they had. Offer value that no one else can, and you can start building lasting relationships with your audience. There are plenty of Nigerian princes in the marketing world, offering the illusion of value and delivering nothing. Set yourself apart (and avoid the spam folder) by consistently providing high-value, impeccably-polished content. Tap influencers, employees, and customers to tell authentic stories on your behalf, and above all, make your content the best answer by grounding it in customer knowledge. What challenges have you experienced when trying to create content that engages your audience, and builds credibility and trust? Good points. I’d agree with all of them. But, besides that, be creative and unique. By that, I also mean – be interesting. That’s absolutely crucial, totally agree. Part of building credibility is showing your personality; letting people know there is a person behind the brand.